The beauty of our program is in the unique look our decorations give to each home. Our selection of decorating elements is small enough to provide simplicity in design, but large enough to give each home its own flair. Read about the choices your designer will give you during your estimate. C-9 Roof Lighting (Facia) - For many of our clients, this element is the basic beginning of their decor pattern. C-9 bulbs are the large type of bulbs that are screwed into sockets on their strings. 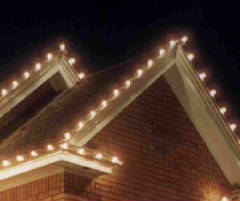 Our installers custom fit the light strands to follow the contours of your roof. The lights are then attached to the edges of your roof (also called fascia) with non-invasive clips that either hook onto your gutters or slip up underneath your shingles. You may choose either clear (pictured at right), multicolored, or any combination you would like of red, blue, orange, green, white, or clear. Our professional installation lends a very uniform, classic appearance to your roofline, and serves as a great backdrop for ground-level decor or other accents. Window Lighting - Window lights are one of our unique features. 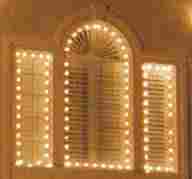 Mini-lights are attached to plastic clips which adhere to the outside glass surface of your windows. We space and position the lights in a uniform manner for a crisp look. Window lights can be used to complement a C-9 roofline, or can be used alone for a unique effect. The beauty of window lights can be enjoyed both indoors and out. Choose traditional clear lights or multi-colored. 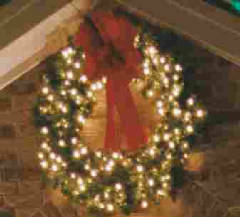 Canopy Tree Lighting (Mini Lights) - Tree lighting is a Christmas Decor signature - we load trees up with mini lights to create a fantastic display. We hand-string the lights into the canopy of the tree, using a technique that covers the tree completely and gives it dimension and brilliance. The tree at left was decorated in multi-colored mini-lights, a good way to add a splash of color to your display if you opted to use clear lights on the structure of your home. Branch/Trunk Wrapped Tree Lighting (mini lights) - Branch and trunk wrapped trees are just that - literally wrapped with mini lights for a spectacular effect. Wrapping is most suitable for small to mid-sized trees with an interesting branch pattern. Although every single branch is not wrapped, our skilled installers select a pattern that highlights the tree without weighing it down too heavily with lights. 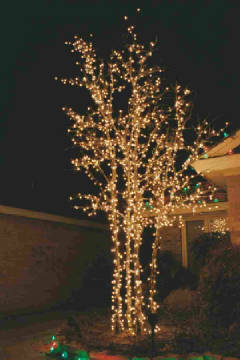 Branch and trunk wrapped trees can be done in any color and blend well with canopy-lit trees. Shrub Lighting - Shrub lighting is an important but often overlooked aspect of decorating. 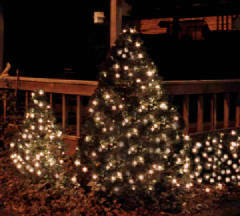 Although many newer homes don't yet have trees that are large enough to light, almost all of them have many shrubs that would look great cloaked in mini lights. Lit shrubs ground your display and offer a great opportunity to introduce color into your display without being overpowering. Since many shrubs are located along the foundation of your house, lighting them provides contrast to any roof lighting you might have. 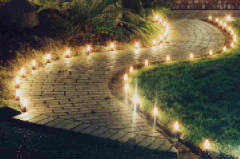 Ground Stakes - Ground lighting is another unique feature of our decorating program. Our ground stakes are C-9 bulbs fastened to sturdy spikes that we secure into the ground and use to outline walks, drives, or flower beds. This type of lighting is especially welcoming to guests during the holidays, and looks particularly nice on curved drives or walks. 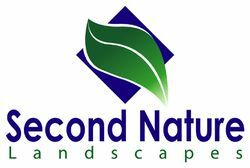 Some customers have also used ground stakes to outline flower beds along their home, echoing the lines of their roof lighting. Not to worry, we carefully set the bulbs off the pavement by about 1 foot to decrease the likelihood of an errant foot or tire running them over. Ground stakes look particularly interesting under a few inches of snow, where they emit a lovely glow through the snowcover. 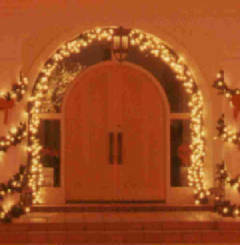 Garland - Although it is also available unlit, our lit garland is a popular choice. Because of its versatility, it can be used in many different places for different effects. One popular application is like that at left: used to create a welcoming entryway by framing your front door, whether it be arched or rectangular. It also looks beautiful draped on porch railings and accented by bows, or can be used swagged over garage doors or under windows. The garland is made of high-quality, professional-grade materials and must be felt to be appreciated - this is not the garland you find at your local arts and crafts store. 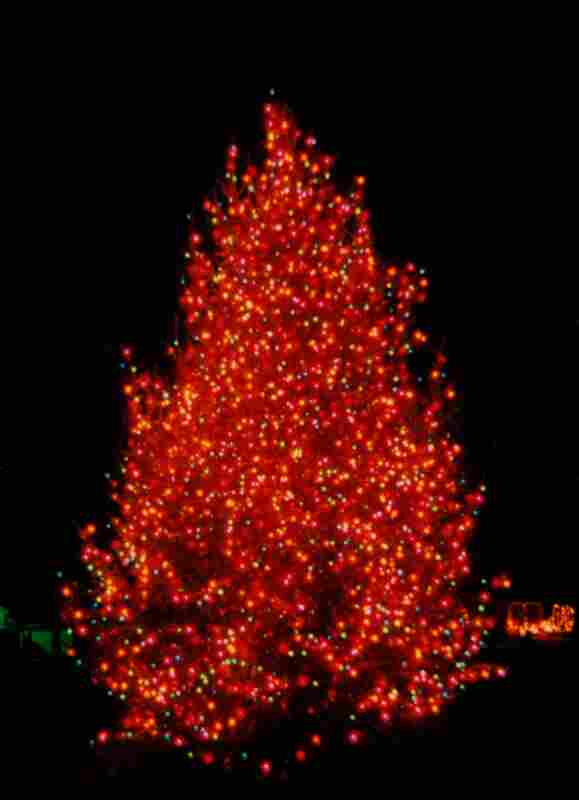 It is "tip-lit", meaning that there is a central vein running down the middle with individual light strands branching off of it, giving the garland strand a fluffy, three-dimensional look. Wreaths - Holiday wreaths add a finishing touch to your Christmas Decor display. Choose from lit or unlit, and add one or many to your package. Lit wreaths look especially beautiful on the tall peaks of modern homes, or in a dark entryway or porch to brighten up the area for guests. Our wreaths come with a festive red bow to add a splash of color to your display. Choose from a variety of sizes from 30" to 60". Commercial sizes may be available by special order. - ask your designer for details. Our wreaths are of the same professional-grade quality as our garland - you simply cannot find quality of this level at your local craft store.